Honestly, a million dollar question, wish I could hammer down the answer. 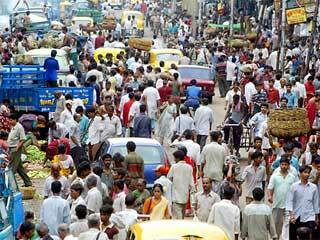 India comprises nearly 2.4% of world’s land & astoundingly supports well over 17% of world’s population. The grim result is: a third of world’s poor live in India. The very fact that India today is the world’s fastest growing major economy doesn’t help either as it further strengthens the argument that this growth of past two decades failed to alleviate the conditions of a vast majority of Indians. Will the population growth turn an asset? Education has to turn ‘universal’. The ‘Sarva Skisha Abhiyan’is more of a populist propaganda than some serious investment into our future. Children enrolled here end up doing dishes (no pun here!) of yet another ‘ambitious’ project: the mid day meal drive; which aims to exterminate child undernourishment by providing ostensibly ‘full- meals’ at public school. So, instead of fostering a culture of learning you end up in a situation where the government losses hundreds of crores to corrupt middle-men & in some cases teachers who are too busy cozening the state. India has world’s largest youth population, this surely makes a good catch phrase for our political class but, unless we arm them with necessary skills they are no better than millions of extra mouths parasitically feeding on the nation’s limited resource. Surely, there are few tragedies as colossal as an entire generation of young people forced to relinquish their dreams of a better future. History teaches us that when the youth of a nation is rendered frustrated; revolutions & anarchy rages through the land. The political class of India has to change: they’re a colonial anachronism & are morally decadent. The ‘Right’ (now this one’ s a pun! )of Indian polity is an abomination bent on destroying India’s fragile social fabric for some diaphanous dreams of a ‘homogeneous India’. The ‘left liberals’ & the Congress Party just can’t get over the fact that India of today is a nation of aspirational class. The middle class wants tangible results: better education, jobs & a sense of security. Their harangue of socialism sounds greek to a vast majority of urban Indians. The system of higher education must reform: on the surface we’ve grown from 20 universities & 400,000 students in 1947 to 564 varsities & 17 million students across 33,000 colleges. That’s commendable; however, the breakneck speed of opening new institutions of higher learning has effectively degraded their quality. Only a handful of Indian varsities are ranked respectably among world’s best. The situation is further convoluted by the fact that there are numerous private institutions running rampant without proper affiliations. This not only underlines the laxity of Indian authorities but, also denigrates India’s position as an emerging hub of higher education (among Asian & African student community). Finally, the people of this nation ought to realize that the government wields no fanciful magic wand which can remedy all of their problems. Initiative for change and progress must come organically from the society that aspires transformation. The very conduct of individual citizens be such that the process of nation building becomes a duty & moral responsibility & not some great onus which is to be shed somehow.